Send us your suggestions for more Q&A's like these at contact@isap-online.com. Q. Why are there two ISAP websites and what do I use them for? A. The Society is in the process of migrating content from the old website at isap-online.com to the new website at isap-online.wildapricot.org. When the project is complete there will be one website again (the new one), and it will be isap-online.com. We will keep you informed as to when the cut-over will occur. Q. How do I use the Member features of the isap-online.wildapricot.org website? Q. Why am I not getting any email from ISAP? A. The Society’s primary mode of communication with the Membership is email. All members should promptly log into the new website at isap-online.wildapricot.org and update their email address whenever it changes. Also be certain that your email filter, if you have one, is not putting our email into your Spam folder. Q. How do I find other ISAP members in my area? A. Use the Directory search feature. Point your browser at isap-online.wildapricot.org. When you get there navigate to the Artist Directory page (hover your mouse pointer over ‘Membership’ in the menu bar and click on ‘Directory’ in the drop-down list). In the ‘Search:’ box enter the name of a city or state, or part of a name. In the screenshot below ‘texas’ was entered in the search box. Take a look at the search results. Now try it yourself. Enter then name of your state in the search box or enter your city, such as Dallas. Now that you know who’s nearby you can organize informal meet-ups or Events. Note: If you login to isap-online.wildapricot.org you will see additional information in the Directory search results such as email address. 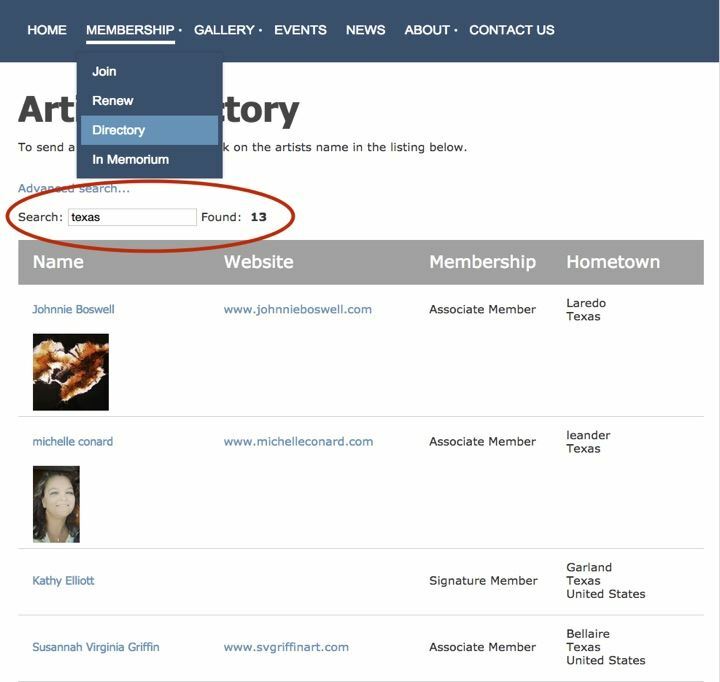 Only members can view other members email addresses in the Directory.